Piggy Bank is seeking strategic partners paying a generous gift annually. Donations pay for livestock facilities, feed, scientific expertise, and the labor required to raise heritage pigs in a controlled environment. Your gift allows us to gift genetics to farms in need and to share pigs with culinary schools around the country. Additionally, we include a widespread package of exposure and benefits for our 'Big Five' Charter Members. Strategic & Media Partners are businesses interested in utilizing media and content to change the future of our food. Strategic Partners help shape the greater conversation by promoting their involvement with Piggy Bank. Strategic Partners are relevant content and media companies that believe in the power of multi-stakeholder interaction to drive positive change. Strategic Partners actively harness content and media relationships to improve awareness of family farming and its impact on safe, honest food practices. 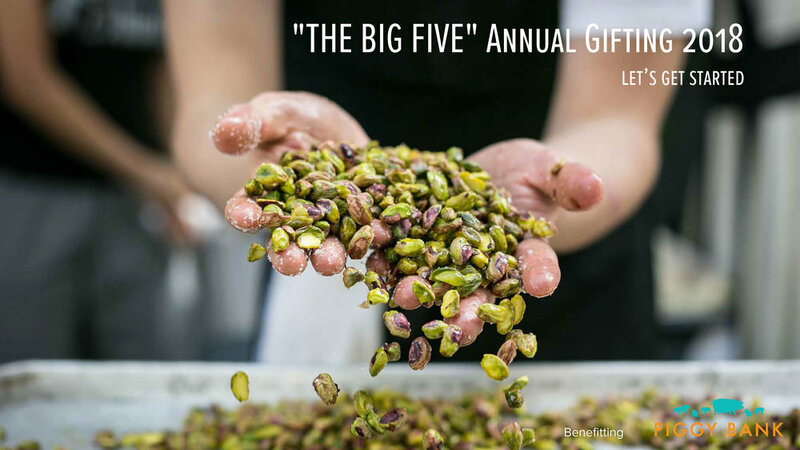 Culinary Partners include schools, restaurateurs, chefs, beverage producers, retailers, distillers, wineries, and other regional partners hosting dinners or charity activations on behalf of Piggy Bank. Culinary Partners help give students scholastic tools to research heritage pigs. Culinary Partners share in educational platforms to help shape the consumption of heritage species including building awareness and goodwill for Piggy Bank. Culinary Partners are invited to contribute each year through in-kind donations including concepts like charity dinners (ex. Chef’s Course), Rebated Beverage Programs, or other customized Contribution Percentage fundraising models. To learn more about Beverage Contribution programs, click here. Commercial Partners include government agencies, concerns in technology, feed, processing, logistics, animal securities, social enterprise, advocacy groups, associations, and commercial businesses that serve the food industry and are aligned with our values. Industry Partners help provide insight and guidance with an eye to offset annual costs. Industry Partners fall into three classes (Product, Brand, and Agriculture) with customized strategies. Industry Partners add considerable value through crowdfunding and hosting annual events publicly and privately.